Enjoy the extensive prospect of No. 18 green against the natural beauty of Talofofo, while enjoying our special lunch service. We offer choice baked salmon for golfers who would prefer Japanese food before their round. You can enjoy steaming rice, hot miso soup, natto and a small appetizer. You can select your eggs from sunny-side up, scrambled, or omelette and enjoy them with bacon, pork rinks, thick soup and salad. We also serve toast and coffee fresh from the coffee pot to give you the energy to ensure success in your round. *Breakfast vouchers issued at Onward Beach Resort are available. *Please note that, depending on the season, a buffet style breakfast blending of Japanese and American food may be served. Enjoy a simple lunch prepared by the hotel chef, using carefully selected meat from Angus cattle, Berkshire pigs, etc. We also offer half-portion dishes, popular with women, a wide variety of noodles, spicy appetizers to go with the beer, and other dishes as a lunch or light meal, suitable for after the round. Luncheon dessert is also a delightful Onward specialty. You can buy sports drinks, beer, etc. A complementary cooler box on the cart, packed with 4 free drinks (3 water and 1 iced-tea) is provided. Light meals such as rice balls and sandwiches are also available. 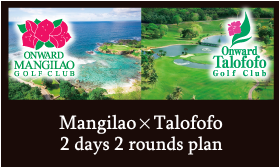 The logo of Talofofo Golf Club is "hibiscus". Beautiful items decorated with this logo are on sale in the pro shop. There are also a variety of items including famous brand-name golf clothes such as “23ku sports”. Original products which can only be purchased in Guam, Talofofo, would make great souvenirs. Enjoy shopping at this refined establishment. Gift certificates and other items which can be used as prizes for your competitions can be prepared to your budget. Please feel free to inquire with staff. There are locker / shower room facilities in the club house. Safety deposit boxes are located next to the front desk. There are 3 private rooms with a seating capacity of 20 each. It can accommodate 100 people without the partitions. You can enjoy the extensive prospect of No.18 green against the natural beauty of Talofofo as well as the restaurant. Copyright(c) Onward Resort&Golf All Right Reserved.